Do you want it all? If yes, then this massive 3 bucket kit is for you. 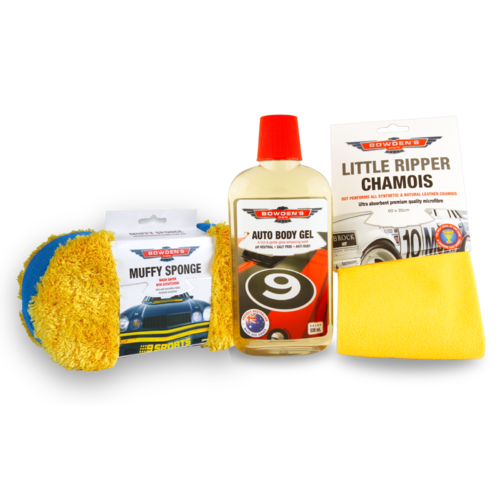 This diverse grouping of our car care products came about as we have car tragics who love our range and wanted the biggest selection they could get. This big bucket upgrade will now have the very best of everything to look after your beloved 2 or 4 wheeled friend. Buckets x 3 (Wash x 1, Rinse x 1, Wheels x 1) + 2 Bucket Lids - Proudly Australian made, solid construction. After Glow - A mega protective, after-wash drying aid. Orange Agent - A safe and awesome pH neutral, citrus cleaning agent. Bugger Off - The perfect companion you need for your next big road trip. Gets rid of kamikaze bug marks, fast. Ta Ta Tar - Safely removes light and heavy tar deposits. Vinyl Care - A unique, silicone free dash and trim protectant. Metal Polish - Gives an epic, mirror shine to your dull metals. Debugger Cloth - Fast, easy and safe cleaning of annoying bug residue. Dirty Deeds cloth x 2 - A very useful cloth, created for all the dirtier jobs around your car and bike. Green Clean Glass Cloth - Cleans glass fast without having to use sprays. Handy to have in your cars glovebox. Circle Work x 2 (Blue Piping x 1, Orange Piping x 1) - Specially created microfibre applicator mitt - save your time and energy to get a beautiful professional finish. Big Softie x 5 (Blue Piping x 2, Orange Piping x 3) - Ideal for buffing off cleanser, polish and wax residues. Perfect for use with After Glow. You save nearly $120 off the RRP when purchasing this kit. You also get our famous race car lollies, a Microfibre Field Guide and our product Flow Chart, plus a ticket to our exclusive Customer Open Day. This kit has kick started my passion for detailing and I could not be more happy with it! this is by far the best kit it has everything that you would want.